Braverman Gallery is pleased to present the opening of Shahar Marcus’ solo exhibition. 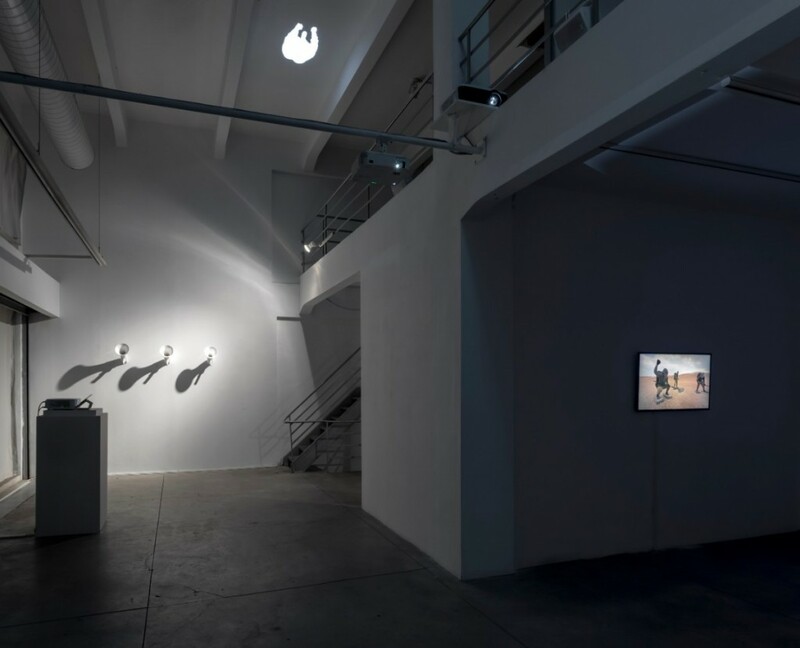 “Rondo” is a multi-channel video installation designed especially to be projected across the walls and ceiling of Braverman Gallery. Shahar Marcus is a performance artist who has been active in the local and international arena for more than 15 years. For “Rondo”, his new solo exhibition, Marcus has created a site-specific performance installation, which, for the first time, utilizes both video and performance simultaneously, thus seeking to expand the boundaries of video as a medium of documentation, and performance as a one-time event, and to connect time and space. Across the length and breadth of the gallery, a moving image is projected. The image is of the artist, Shahar Marcus, dressed in military uniform and filmed from above. As the artist’s figure marches forward at a steady pace, his two hands move along according to the rhythmic sound heard throughout the gallery space. First appearing on the ceiling, the soldier marches back and forth incessantly along the gallery walls, and multiplies and expands until eventually shrinking back into a single, moving image. In the center of the space is a porcelain-like sculpture composed of castings of megaphones arranged in a manner reminiscent of flora, a tree, or lotus blossom. The cast megaphones turn outward, and they sound the voice of the commander leading the soldiers. While the sculptures are of fragile appearance, they constitute the primary element in command of the soldiers’ march. The use of soldiers, and military motifs and ceremonies, are not foreign to Marcus. Precedent to “Rondo”, is his work “1, 2, 3, Herring” (2011), in which an image of the uniform-clad artist is duplicated on cardboard targets used for shooting training, or, in the work “The Fathers Have Eaten Sour Grapes” (2008) where Marcus delivers the Prophet Ezekiel’s famous biblical speech by the same name, while dressed as a dictator and eating his medals, made of cookies. The act of eating cookies diminishes the text, turning it into background noise and cancelling its original meaning. In “Rondo”, Marcus returns to the same mechanism, though this time applying it in a slightly different manner. He seeks to eliminate himself as a human being and transform the human into a symbol, an icon of power. The large megaphone plant is placed in the center of the space. It is not made of regular megaphones, rather they are porcelain-like sculptures from which the sound of the “Big Brother” commanding voice emerges and proclaims: “Beid ou Batata” (From Arabic: egg and potato). The phrase is based on an urban legend about armies in which soldiers would march with an egg in one hand and a potato in the other, symbolizing right and left. The military march dates back to ancient times, when warriors would march in an organized, dense cluster. Such solidity was difficult to subjugate, and is known to have led the many generals who employed it to victory. Today, this type of warfare is meaningless, and military marches are conducted in a ceremonial manner only, to educate soldiers and maintain a high level of discipline. For Marcus, the march attests to death, the death of the individual. From a daily dispersal tool, the megaphone becomes an object of desire that represents the focus of power, present within a virtual system in which a person is imprisoned without the possibility of escape or growth. The megaphone becomes noble, sanctifying the call to march. Marcus continues his preoccupation with the human, though in this case, he produces a performative gesture that examines the relation of the human in the virtual space. The act of performance places man at the center, as the essence of human existence. What is this human existence in Marcus’s opinion? The exposure of mechanisms, the combination of an old world and a new one. Of physical performance and performance in the virtual realm. Of body regimenting acts and technological manipulations. In Marcus’s work we observe these “human mutations” in a mechanical march, replicating and recurring over and over with no clear purpose. Credits: Dr. Eran Erlich and the Department of Ceramic and Glass Design, Bezlael. Efrat Kutiel, Shaked Cohen, Dror Shoval, Tal Hamzani, Dana Haras, Eyal Sibi, Andre Friedman, Faculty of Arts, Kibbutzim College of Education, Tel Aviv. Special thanks to: Sasha Serber and Noga Rozman. תודות: ד”ר ערן ארליך והמחלקה לעיצוב קרמי וזכוכית, בצלאל. אפרת קותיאל, שקד כהן, דרור שובל, טל חמצני, דנה חרס, איל סיבי, אנדרה פרידמן, הפקולטה לאמנויות, סמינר הקיבוצים, תל אביב. תודה מיוחדת לסשה סרבר ונגה רוזמן.